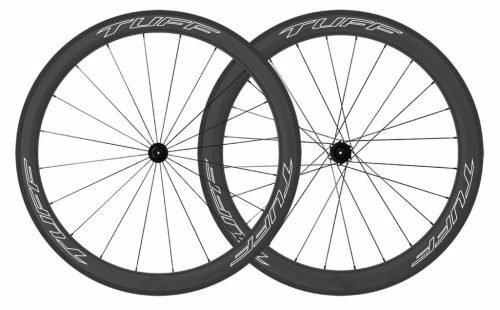 Boasting an already extensive range of products – with bike wheels that utilise the latest carbon fibre technology – Tuffcycle are now increasing their catalogue of rim options. Meaning Tuffcycle are confident they can provide a product solution for every cycle customer. The modern cyclist yearns for the perfect balance of strength, speed, lightness and affordability from the road bike wheels that they buy. However, prioritising one attribute so often means compromising on another. A strong wheel can end up being unnecessarily heavy and slowing you down. A light wheel can wear down quickly over time. Affordability can so often mean low quality. That is why Tuffcycle are dedicated to providing the highest spec road bike wheels for the lowest possible cost. A good example is the new EXO wheels with MATRIX carbon fibre spokes. Thanks to cutting edge technology, and know-how acquired through their many years of experience, Tuffcycle are able to provide wheels with significantly lower weight than the wheels of many equivalent high-end brands, while keeping their prices significantly lower. But the advanced technology Tuffcycle use is not limited to just the EXO range of wheels or indeed to road bike wheels. Thanks to their close relationships with numerous specialist factories their latest developments are being incorporated into all the rims that Tuffcycle supply (tech that is not yet even available to some of the “big names” in the carbon fibre rim market). Their mountain bike wheels utilise a blend of T700 and T800 carbon to produce lightweight rims which are long-lasting, hard-wearing and not at all brittle. Customers can choose both rim size and width to provide whatever performance level they are looking for. A wide selection of hubs is available to suit any budget or frame, and Next Generation (NG) moulded and reinforced spoke holes help to improve structural efficiency and to reduce the overall weight of the bike. Meanwhile when it comes to choosing road bike wheels, customers are well served by upgrading to Tuffcycle’s ultralight weight EXO wheels with carbon spokes. Other options include premium tubeless compatible carbon clinchers, rapid carbon tubulars, and saw carbon road disc brake tubeless compatible wheels. Tuffcycle’s product range is ever expanding, with more and more rim options to suit every cyclist, including the latest 650b gravel wheelset. Whatever the modern cyclist is looking for can either already be found on Tuffcycle’s website, or else it very soon will be. Tuffcycle is a company dedicated to providing its customers with the highest quality cycling products at the most competitive prices. With an emphasis on cutting edge carbon fibre wheels, Tuffcycle use their years of experience and knowledge in the global automotive industry to help their customers find exactly the right product for their specific needs.